7. Why is Bossk barefoot? 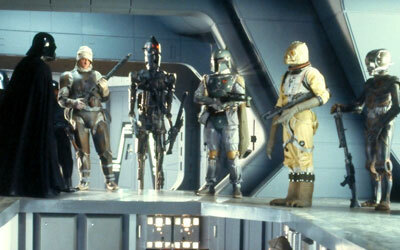 Our first glimpse of the bounty hunters in The Empire Strikes Back features Bossk’s horny old toes hanging over the command deck of the Executor. An Imperial officers looks up at him like, “Where the hell are your shoes?” Does he own shoes? Can he wear shoes? At heart, is Bossk just a tree-hugging hippie? These are all good questions, but I like to think that his lack of footwear is actually just a sign of good manners. It’s like when you visit someone’s nice clean house, and you take off your shoes in the doorway, even though you are not asked to do so and despite the fact that others just tromp on through. I like to imagine that Bossk saw the shiny floors and tidy hallways of the Executor and decide to show a little bounty hunter courtesy. 6. Is Boba Fett poor? In Attack of the Clones, the Kaminoans make a point to tell Obi-Wan that Jango Fett receives a “considerable” salary for his work. This appears to be true, as Jango has a shiny suit, a sweet spaceship, and a nice apartment with a great view of the rain. Yet, Boba Fett wears battered armor and flies around in a hand-me-down ship, which is the Earth equivalent of cruising in your grandma’s 1987 Buick Skylark. 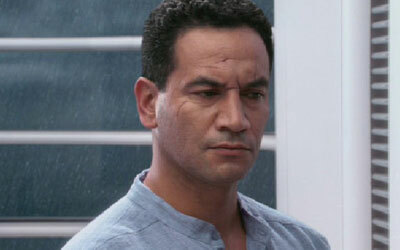 Was Boba cut-off because Jango was not his biological father? Perhaps his inheritance didn’t kick until age 21. 5. Who actually hired Jango Fett? 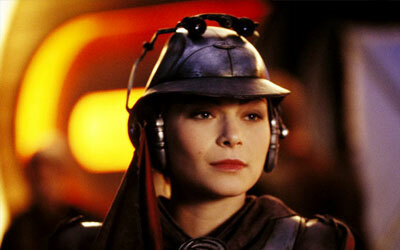 We’re told that the Viceroy of the Trade Federation ordered the hit on Senator Amidala as revenge. However, it’s clear that if the assassination plot succeeded, she would be unable to vote on the military creation act. As she is the leading voice of dissent, resistance would most certainly die down, and the act would pass, creating a demand for the clone army. This makes sense, of course, but why would Dooku risk this plan by assigning the task to Jango? Things turned out in their favor, yes, but if Jango was traced back to the secret clone army prematurely, the entire plan could have been ruined. 4. Why would Jango assign an important task to a less competent junior partner? Assuming that Dooku allowed Jango to carry out the assassination knowing that possible exposure of a ready-made army would only create support for military action against the Separatists, why would they take steps to conceal Jango’s participation? 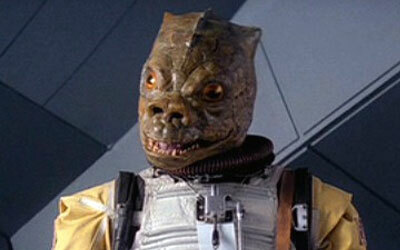 Using Zam Wesell, a less competent bounty hunter, makes little sense. If Jango succeeded then the army would be exposed, and if Jango failed then the army could also be exposed (are we all following this?). Both scenarios would work in the Sith’s favor. However, with attempts to conceal the plot, only a crazy series of coincidences (what actually happens in Episode II) would set the plan in motion. 3. Would there be many bounty hunters during the Golden Age of the Republic? The Galactic Civil War, the time of the original trilogy, is depicted as a kind of Wild West frontier, full of smugglers, scoundrels, and bounty hunters. This makes sense, as there is a rich Empire willing to pay handsomely for fugitive Jedi and renegade rebels beyond the reach of Vader and his cronies. 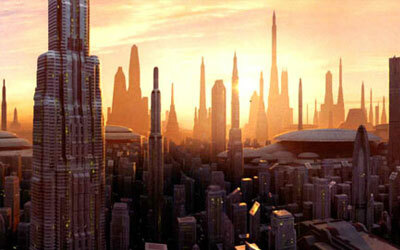 However, the time of the prequel trilogy is “a more civilized age,” policed by the Jedi. Would bounty hunters be able to flourish? Would they even be necessary? It almost seems as if Lucas added them in Episode II to reference the original trilogy. 2. 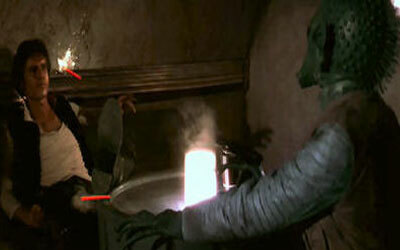 Why, oh why, does Greedo shoot first? I realize that this question is by now a science-fiction cliché; however, in a list of questions about bounty hunters this one has to be included. Many fans point out that this egregious change undermines Han Solo’s character arc from selfish rogue to selfless hero, and they are correct. However, I hope to offer a new point in this argument. My argument centers on the table in the bar. “The table?” you ask. Yes, the table. The Mos Eisley cantina features stylish, space tables that lack a typical tabletop. With a tabletop, Greedo wouldn’t be able to see Solo going for his blaster, but as it is, Solo’s move to his holster is fairly obvious. Greedo is not only a bad bounty hunter, he’s also an idiot, making it completely ridiculous that he could possibly outdraw Solo. 1. Does George Lucas think we’re idiots and will just accept any lame bounty hunter as a cool antihero? 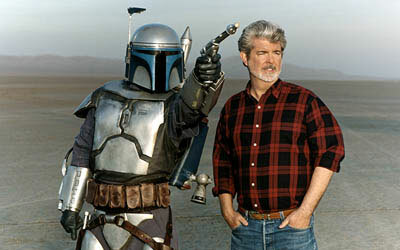 During his public appearances to promote the release of The Phantom Menace, Stephen J. Sansweet, the Indiana Jones of Star Wars collecting and official Lucasfilm liaison, claimed that Aurra Sing would be the new Boba Fett. Sing, the bald albino bounty hunter with a rifle slung over her shoulder, is briefly glimpsed during the Boonta Eve podrace. 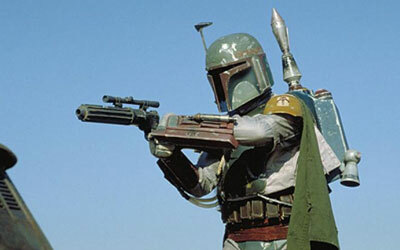 The new Boba Fett? Does Lucas actually think that we would drool over a character for just looking cool, despite the fact that she does absolutely nothing? Contrary to what some may think, Boba Fett hardly did nothing. In addition to looking badass and mysterious, Fett got the drop on Han Solo without sticking a blaster in his face, let alone even firing a shot. He got Solo by thinking like him, by anticipating his next move. 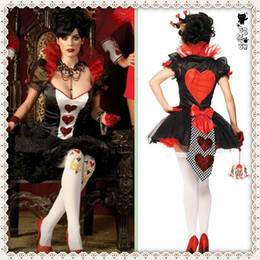 And that is cool! Now if Aurra Sing had turned towards the camera during the podrace and said, “Well, this is all a bit anti-climatic,” we may have given her a second look.